Home PC Tools Reviews Is Noob Killer a reliable Virus Cleaner? Is Noob Killer a reliable Virus Cleaner? My first encounter with Noob Killer is when my friend gave me a collection of Computer Repair Tools burn in CD last year and it was included there. I wonder how this tool works because I have no idea about it, when I scan my computer using Noob Killer to spot worm and other threats it works fine but I didn’t like the Interface too small and cute. Noob Killer is just a simple Virus Cleaner utility created in Visual Basic Language designed by a Filipino aka. "Leerz" to remove popular worms (VBS- Solow) known as Hacked by Godzilla and Taga Lipa variants that infects and spread through Flash Drives or Removable storage. By some improvements lately, it armed Noob Killer for intensive detections on new types of PC threats. >iloveher.exe | say no to drugs!!! •Allows restoring windows important tools like Folder Options, TaskManager, MSConfig, Regedit, Task Bar Right Click and Internet Explorer caption. The new version was under testing to work with vista and online update is available. Who are using Noob Killer? Noob Killer have numerous users from the phillippines and worldwide. I have notice that majority of Computer and Cellphone Technicians knows Noob Killer because it is popular on IT forums online .Yeah, anybody could use Noob Killer because it is totally free and it is available to download online. Based on my experience, Noob Killer is safe to use and effective for worm threat removal but not good for Recycler virus. Noob Killer is not an Antivirus program it’s a Virus Cleaner after you have scan and clean your PC install a reliable Antivirus Software to monitor, block and remove threats. 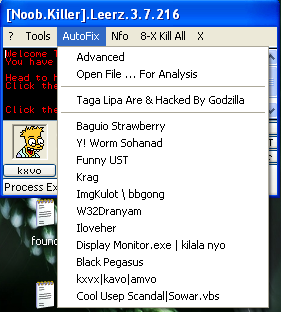 Basically Noob Killer works great on worms, autorun.inf, .vbs and other local Pinoy made viruses. I don’t know if Leerz is a certified professional to build this utility because he doesn’t reveal his real identity to public.I believe he build Noob Killer to help other people. I suggest that the interface must be improved to emphasize user-friendly. Why not make a medium size main panel like in WormBlaster and put larger buttons with detailed labels. Remember, not only computer geeks will be using your invention when people find your tools effective and useful they will recommend it to their friends then user friendly issue is a big deal.